Being Frugal often means SPENDING YOUR MONEY! I'm serious about being Frugal here folks... so give me a minute to explain my thoughts, keep on Reading! Sometimes, the Most Frugal price actually has the most digits! Yep! The best price is often the Very Best that you can Afford option... at least right up front, in terms of intitial 'face value'. Huh? How can that be? ... How can you Save Money being Frugal, by paying the highest price? Well folks, stop for a minute and think 'bout it. Just 'cause you can get it for 1/2 price at Wal Mart... does that mean it's gonna do the best job for you? Nope... uh uh... not even... it ain't how to measure what's proper! 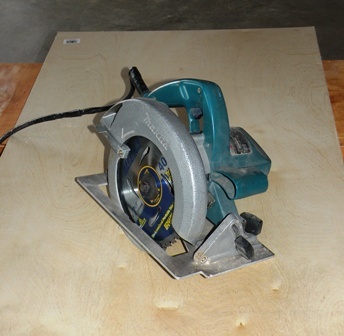 Many years ago, something like two years before we got married, I bought a Makita Circular Saw. As I remember the year was 'bout 1977 and I paid right around $125 for that saw... a pretty big price in those days. ... and this, boys and girls is THAT saw, some 33 years later! I'm still using it... it is my ONLY circular Saw... It's the saw I'm using on my current RV Remodel! That piece of junk lasted him 'bout a year or two, and did a poor job that whole, short, time. Over the years I lost count of the saws he had to buy, to replace those that failed (usually in the middle of some project); claiming each time he was 'saving money'. He cussed each of those saws the whole, short, time he used 'em, for their poor performance... Then, went out and replaced it with another identical piece of junk! And that right there is where the Frugal RVing and Frugal Living 'paradox' comes in. ...while the guy 'trying to be Frugal', by ONLY looking at the Cash Price, spent years of frustration, struggling with a poor tool... and having to buy replacement after replacement... spending, in CASH, well over double what I have... and he STILL doesn't have a GOOD tool! You know what my button punching on that $3 Wal Mart calculator came up with? I could buy a nearly new truck... with a warranty... for 'bout half, in monthly payments, what it was costing me each month in repairs, averaged over the previous two years. Sometimes, being Frugal is more than the Dollar Cost.. sometimes the cost gained in frustration and stress exceeds any possible savings in dollars. Eliminate those frustrations and stresses at the cost of a few dollars... and you'll find yourself miles ahead. You'll have so much more mental and emotional 'energy' left to deal with all the 'other' problems and obstacles that jump up, that they'll likely shrink to insignificance! Your whole life will take on an unexpected shine... all from looking at 'things' from a lil' different perspective. Now, I'm not telling you to just go out and spend double... If you think that's my idea of being Frugal, sorry, you've missed my point. What I'm saying is look at the performance and the correctness of the tool... or whatever... for your intended task... FIRST... and its' dollar cost second. Debt, is a dangerous servant. Like Fire, it can do wonderous things for you... How-some-ever... if it is not kept under strict control it'll burn you!. Exercise extreme care in accepting any. Sharpen your pencil and really look close before you sign on the dotted line. It is a Risk. If you let it into your life... Keep that beast on a short leash! But, now the caveat... I'm not one to tell you to WAIT... precious years of your life... "Until times are better"... Generally those "Better Times" never seem to show up on their own... It's always; "Maybe next week, next year..." till you just wanna rip an' tear! Sometimes... You gotta go out and MAKE times get better. In the end, my being frugal bottom line is... Buy what you need and can afford... but... Only, buy the VERY BEST, that you can afford! Going half-way... half-assed... 'cause it's "on the cheap"... can mean... You Only, Half Lived! Do it as low cost as you can... But... Do It Right! Being Frugal shouldn't be about doing without... but doing MORE with what you have. It SHOULD BE about squeezing ALL the juice out of the Fruit!... Doing all you can, the best you can, with what you have. Being Frugal should be about Living Well... NOT... existing in enforced poverty.